[prMac.com] Pune, India - Rolocule Games today announced that Dead Among Us is now available to download for free as a universal app from the Apple App Store worldwide. Dead Among Us brings an incredible new way of playing shooters on mobile devices with its innovative single-hand controls. This addictive new first person shooter takes players on an exciting ride of killing zombies in a stunning post-apocalyptic setting across various breathtaking 3D locations. "We believe that Dead Among Us sets new gameplay standards with its single hand controls for first person shooters on mobile devices and would impact the way we imagine this genre for smartphones," said Rohit Gupta, CEO of Rolocule Games. "Dead Among Us not only brings all the excitement of a sniper-styled shooter but also offers players with powerful story experience along with deep strategic thinking." Dead Among Us starts with 95+ quests that are spread across different quest types like Star, Challenge and Regular quests. 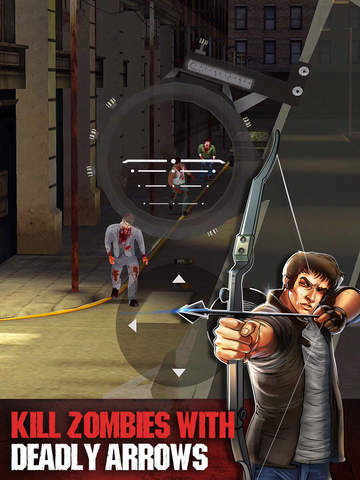 To give players extra boost, the game offers three power ups - Radar to quickly spot the zombies, Slow time to aim better and Kill Shot to kill powerful zombies with just one arrow. The game has multiple zombie types and locations with many more coming soon in upcoming updates. The game also promotes social gameplay where players can record their gameplay and even provide their own voice overlays to share with their friends on various social channels. Rolocule is also working on an Oculus Rift variant of the game which will bring motion controls to Dead Among Us, thus enabling players to play the game like a real archer in an immersive virtual world using Oculus Rift. Release date for Oculus Rift variant is not yet set and is dependent on Oculus Rift's commercial launch. Rolocule Games is an award winning mobile entertainment software company that creates a unique blend of world-class games and next-gen mobile technologies used by millions worldwide. Rolocule has developed and published multiple successful mobile games like Flick Tennis (winner of the People's Choice Award at the 8th International Mobile Gaming Awards (IMGA) in Barcelona, Spain), Motion Tennis (winner of Edison Award 2014 in San Francisco, USA), Dance Party (Selected as App Store Best of 2014 by Apple) and Super Badminton. Rolocule is also recognized as the 10 developers that are reshaping the global mobile industry by pocketgamer. Rolocule, Rolocule logo, Dead Among Us, Dead Among Us logo are registered trademarks of Rolocule Games Private Limited in India and other countries. All other trademarks are the property of their respective owners. Copyright (C) 2015 Rolocule Games Private Limited. All Rights Reserved. Apple, the Apple logo, iPhone, iPod and iPad are registered trademarks of Apple Inc. in the U.S. and/or other countries. Other trademarks and registered trademarks may be the property of their respective owners.